The John & John range features simplistic, yet fascinating imagery among geometric coloured shapes. They are flavour colour coded, with broad coloured areas mixing it with equally large white areas in a sort of semaphore effect. Each different flavour features what appears to be a rather random line drawing graphic of an animal. Best of all, each variety features a dominant No: 3 etc., to presumably represent how many different flavours there are. The overall effect borders on the right side of Terry Gilliam insanity! 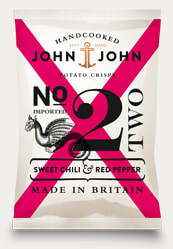 Quite simply, these are among the best food packaging designs we have seen, let alone Crisps. While these Crisps featured some initial brittle cracks they broke down like fairly traditional thick cut Crisps. And unlike many Hand Cooked Crisps they broke down to mush rather than mulch. There was a nice array of bends, curls and even a few gnarls. There was a bit of skin on some edges. There was also a nice supply of oil blisters. The Crisps were a mix of a yellow and oil transparent with lots of little green flecks. There was a very good Sweet Chilli flavouring to these Crisps. Most notably, it was not an overly Thai influenced Sweet Chilli like many of this flavour description. I am not sure we could dissect a Red Pepper, but there was a peppery base.